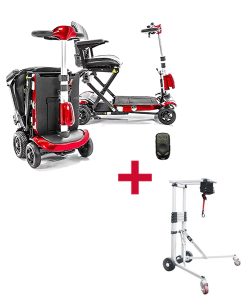 The new and improved Pride GoGo electric travel mobility scooter features an auto-latching lockup mechanism that permits simple frame separation with only one hand. Front frame-mounted seat post offers maximum stability and it’s all-new frame design easily disassembles into 5 super lightweight pieces for convenient transport and storage. SKU: N/A. Category: Mobility Scooters. Modular design for easy serviceability and convenient off-board dual voltage charger can charge your battery pack on-board or off-board. At the heart of Pride’s philosophy is the understanding that mobility products empower lives. Through industry-leading, consumer-inspired designs, Pride offers an innovative, distinctive and performance driven comprehensive line of mobility products to help customers lead the most active, independent lifestyles.